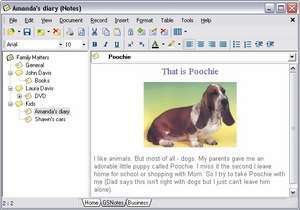 GoldSectionNotes (or GSNotes) is a personal note keeping and organizer with a user-friendly interface. It resembles a lot of other note-keeping applications from a few years ago and allows you to organize notes and collections under various categories. Some of GSNotes' functions resemble a standard word processor and therefore, you are able to format your text pretty much any way you want; GSNotes also allows you to add images to the files it keeps. The very straight-forward and simple design of GSNotes makes it a great program if you're wanting a very simple program to keep track of simple tasks, therefore it is not recommended for use in a business setting.